« Brooklyn Yoga Life: The Durga Connection, What is power? What is service? Today I rode my new-used bike in Prospect Park to go to the bank. As of June 12, 2012 I am officially car-free! The other day to get my feline Bebe’s records, I rode to the Vet in a neighborhood that I would always drive to and suffer looking for parking. Riding on one of the many bike paths to get there was a joy! Bikes create sukha (good space) in Brooklyn! Getting around on a bike is soooooo much more enjoyable than driving a car. On a late Spring, June day like today, it is positively heaven. There are the smells of fresh mown grass in the park and the sweet scent of trees in blossom all around. Right now I am sitting at my favorite spot near some water falls right off the path near Long Meadow in the park. There is a new bench (dedicated to Sara E. Campbell, 1975-2010) in the perfect spot to hear the water falling and the birds singing. I am watching a small red cardinal and a red breasted robin forage for food. At the ashram I felt very connected to the many birds that lived there including two chickens. Crazy Henrietta and baby Chick Chick must have escaped from their coop on the property next door. They must have figured out they were safe at an ashram where all be meals are vegetarian. Safe and well-fed! 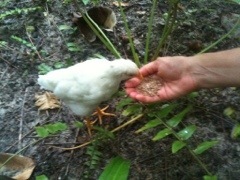 Besides lots of left over homemade bread crumbs, we gave Chick Chick grain from the kitchen. There are other ways i have become more green since the return to Brooklyn. I have not bought any paper towels. In the kitchen at the ashram we used cloths for clean up. Throwing a few cloths into the laundry I would already be washing seems much more Earth-friendly. Not to mention more cost effective. There is still a lot more I can do. One of the biggest personal consumptions I became aware of while living in a tent was electricity. I used very little there: a lamp, a fan, a laptop. Back at home as I was clearing out “stuff” I found a large assortment of no longer used electrical devices and a box of orphaned adapters. I notice how many electrical outlets there are in my home. And how many things are plugged into them. And where does the power come from? Basically oil. So though riding a bike instead of driving a car is one giant step for the return of green on the planet, I have many miles to go to becoming the deep shade of green that I like.